The mechanics are our most important asset, and the repair department is the heart and soul of our business. Our repair areas are visible to customers, and we invite you to have a look. Cosmic Bikes is home to some of the most senior, continually working bicycle technicians in the city. 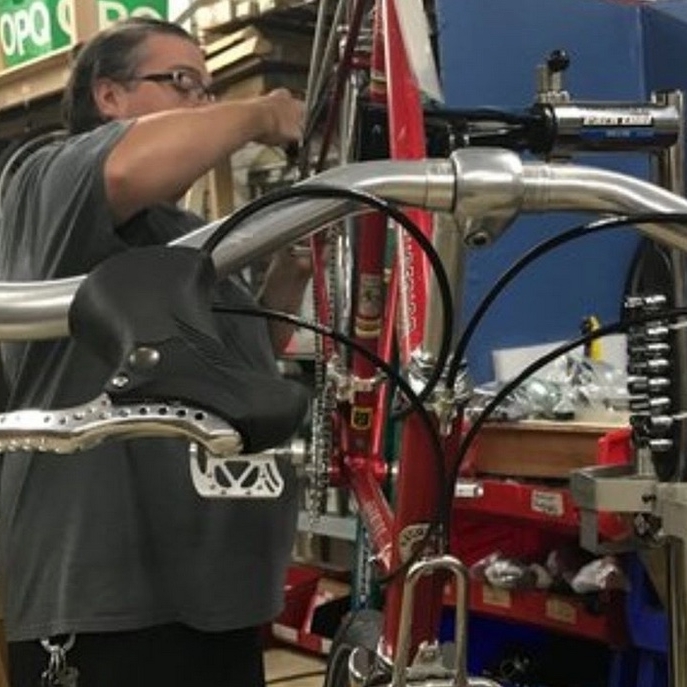 While anyone can grasp the basics of bicycle repair, true expertise in this field, as in any highly specialized trade, comes only through years of work and hands-on experience. Our mechanics have honed their skills at some of the most respected and demanding repair shops in Chicago, making our Service Department second to none. Our mechanics are passionate about their work, highly skilled, personable, and, because they are themselves cyclists, they can clearly explain how the recommended repairs will improve your ride. You can count on their expertise, and solid, street-tested advice, and have the confidence that when you bring your bike in for repair, you're leaving it in good hands. Ideal for bikes that are in fairly good shape, and do not require any replacement parts. Perfect for getting your bike ready for the season of recreation. If needed, replacement of any external moving part or component (excl. frame or fork), including chains, cassettes, frozen brakes, cranks, chainrings, etc. without additional labor charge. If needed, replacement of worn rim liners, and correction of any problems with the inside of the rim to minimize the chance of flats. ONE-YEAR Flat Protection Guarantee: we will replace your tube FREE OF CHARGE if you get a flat during that period. Pricing varies based on tire choice. Stop in for a complete quote. Below is the summary of typical services we offer, but much more is available, from simple adjustments to complete customizations. The ongoing maintenance and discounts included in this service cover the entire cold riding season from October through March of the following year. Available starting in October. If you're not inclined to ride this winter, you can store your bike at our location FOR FREE with the purchase of Major of Deluxe Tune-Up Services listed on the left. We will help you select the right service package for your bike. We'll even give you an 10% off any repair parts needed or accessories you choose to make your spring biking more enjoyable. Then we will store your bike all winter, safe from the elements, dirt and theft, freeing up your storage space for your skis, snowblower, or all the extra pairs of boots! Storage without a tune-up is also available for $50/bike. With either option, you can pick up your clean and shiny bike any time before April 30 the following spring. *All seasonal tune-up labor and parts charges must be prepaid when you drop-off your bike for service and/or storage. Please keep in mind that the prices listed are for Labor only. Many bicycles will require replacement parts for safe and proper functioning. We cannot offer estimates online or over the phone, however when you come in with your bike, you will receive a complete estimate for your approval, including labor, parts and time-frame for completion, before we proceed with any repairs. Estimates are free of charge. All bicycles, including children's bikes, are vehicles, and require certain components to operate properly to ensure safety. We cannot be responsible for the safety of the components that you do not allow us to service or replace, and may therefore decline to perform any repair that will not result in a safely operating bicycle. We charge $5 supply and recycling fee on all our major tune-ups, complete assemblies and custom builds, and some a la carte services. This is to help offset the cost of cardboard recycling, and shop supplies and materials, including cleaners, lubricants, small hardware and shop towels. All of our labor is guaranteed for 30 days. Specific services carry longer guarantees, as described above. We stand behind our services, and promise to make any needed corrections or adjustments free of charge during the period covered by the guarantee. In rare cases, additional parts may be needed to correct the problem. With the exceptions of inner tubes on warranty flat repairs, additional parts are not included in the guarantee. In order to keep track of your repair history, we keep detailed records of your services under your account. Our Labor Guarantees are non-transferrable, and apply only to the original purchaser.